My interests include temperate European Iron Age social and political dynamics, particularly as evidenced in the settlement record, including the post-Roman Iron Age of Scotland, and especially that of the Picts. My direct field experience in France has been focused on central France: at Levroux (Indre) and more generally in Berry; in Limousin; and in Burgundy, more particularly at mont Beuvray. Much of this interest was based within a wider interest in the emerging complexity of the Late Iron Age of this and neighbouring regions. Since the mid-1990s, I have been working in collaboration with Dr Olivier Buchsenschutz (CNRS Ecole normale superieure, Paris), Mr Jacques Troadec (and his staff: Service archéologique de Bourges-Plus) and Dr Pierre-Yves Milcent (Université de Toulouse-le-Mirail) on the evidence for a precocious and outsize protourban settlement at Bourges datable to around the fifth century BC. I am involved in fieldwork and excavation in Berry, including providing advice (with my colleague Olivier Buchsenschutz) to other hill-fort excavators in the region e.g. at Châteaumeillant. Presently (and for the foreseeable future) my main effort is at and around Bourges, in Cher (see bibliography). In 2009 I undertook small-scale exploratory work in the Bourbonnais with Dr Patrick Pion, Université de Paris X (Nanterre) at the vitrified and calcined promontory fort of the Eperon des Charmes, at Bègues, Allier and in 2011 examined a small enclosed site defended by a murus gallicus at Meunet-Planches, Indre, again with Dr Buchsenschutz. Work at Bourges since 1995 has included excavations around the southern periphery of the town (in the Auron valley – now published), in the core of the town (including the Hôtel-Dieu site: now published) and on its eastern edge (Port Sec Nord and Sud: also now published). At the last-mentioned site, major collaborative excavations, covering in excess of 15ha, revealed fifth century BC workshops and associated features accompanied by a suite of Mediterranean imports. The budget has been met very largely from French sources and administered by the Communauté de Communes de Bourges-Plus, as successor to the Ville de Bourges. This work on late Hallstatt and early la Tène Bourges is part of wider programmes in eastern France and western Germany, including a German Schwerpunktprogramm, directed by Professor Alfred Haffner and the late Dr Jörg Biel. I have edited (2006: with Professor John Hunter, University of Birmingham) the second, substantially updated and revised version of Archaeological Resource Management in the UK. Historic Scotland published research (with Andrew Dunwell) on the management of cropmark archaeology in eastern Scotland in 2008. I published a small synthesis on Pictish hill-forts in 2004, and am presently (in collaboration with CFA Archaeology staff) writing up fieldwork at Burghead (on behalf of Burghead Headland Trust). A synthesis (with Andy Dunwell, CFA Archaeology) developed from the major fieldwork undertaken in Angus conducted as part of the Department of Archaeology’s ASAP student training school project, but privatized as a result of the university’s decision to disengage from applied field archaeology, appeared in 2008. I have other post-excavation/publication work underway on this area, notably on Balbridie Timber Hall (Aberdeenshire) and that excavated by the late Dr Brian Hope-Taylor at Doon Hill (Dunbar: East Lothian) in the mid-1960s. Although no longer actively involved in fieldwork at Mont Beuvray, I am still monitoring change at the Porte du Rebout, reconstructed in association with the architects of the Service des Monuments historiques, Dijon at a cost of c. £0.25m. A general book on hill-fort defences in Britain and beyond was published by Tempus in 2006 (revised edition 2013). Aside from the work at Bègues (mentioned above), I maintain a long-standing interest in vitrified forts and experimentation, on which I have recently worked with Professor David Sanderson (SUERC, University of Glasgow) and Dr Patrick Pion. 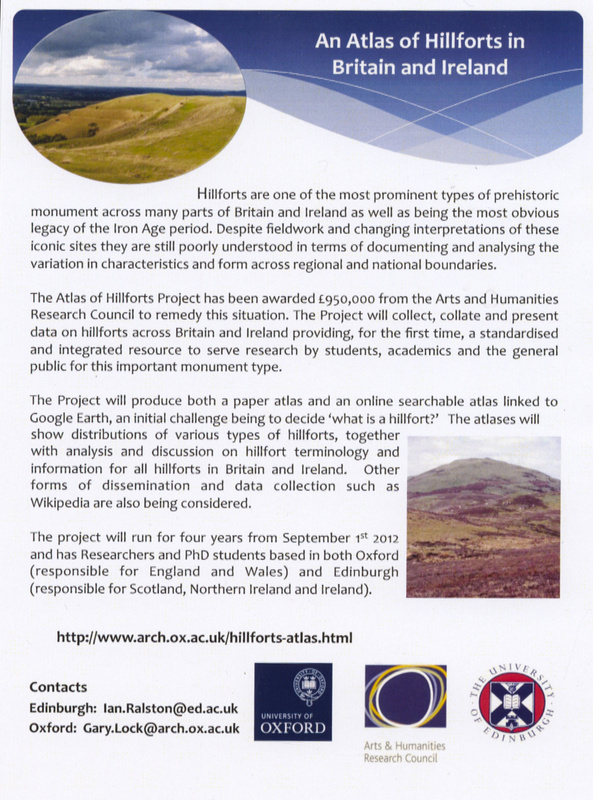 In autumn 2012, I began a four-year major project funded by AHRC to produce an Atlas of Hillforts in Britain and Ireland run jointly with my Oxford colleague, Professor Gary Lock. I have contributed papers on the first two Abercromby Professors of Archaeology at Edinburgh (Gordon Childe, FBA 1927-1946: European Journal of Archaeology 12, 2009) and Stuart Piggott, FBA 1946-1977: Ralston & Megaw 2004); and on the ‘discovery’ of timber roundhouses in excavation. I am presently supervising (as first or second supervisor) 13 MPhil / doctoral students working on Scottish ironwork (with Dr Fraser Hunter NMS), iron slags from Britain and temperate Europe (with Dr C Pickard), predictive modelling in New Mexico (with Prof James Crow), hillforts of western Scotland (with Strat Halliday), the dating of hillforts (with Prof G Lock, Oxford), Roman communication networks in N Britain (with Prof J Crow), facial soft tissue (with Dr E Kranioti); Gerald Baldwin Brown (with Prof R Rodger), souterrains in Scotland (M Phil with Dr M Fernandez-Goetz), Bronze Age bladed implements with Dr M Fernandez-Goetz), aspects of battlefield archaeology (with Dr T Romankiewicz), late Iron Age to Gallo-Roman ritual practices (Classics: with Professor E Sauer), and early historic travel in north Britain (with Dr Bill Aird, History).